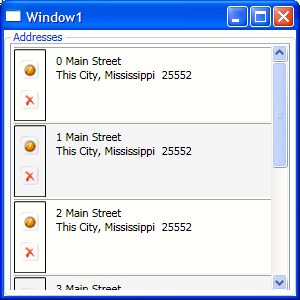 WPF has a number of different Templates which can be applied to controls, and the DataTemplate is the one that's used for things like ListViews, ListBoxes and ComboBoxes. These things have great and wonderful powers. I use them a lot--mainly when I'm trying to display complex data via a ListView--complex data such as a history of addresses for an entity. Consider, an address has 4-8 fields of data associated with it: 2 or 3 Street lines, a city, a region, a postal code and possibly country and county data. In addition to the data, I want to have command buttons that allow me to perform EDIT/DELETE operations on that line of data. The problem there is that it doesn't provide the edit controls that I like having on such complex data types. Plus, there is confusion on what action should be performed when the user selects the item. So, I build myself the DataTemplate. I define that I want all these elements in a specific order, binding as needed. Additionally, since I have the command buttons in the data template, it's DataContext is automatically an instance of my Data Object, so I have a handle to that specific Data Object via the SENDER parameter of my Click Event. Of course, that alone will give you a very ragged edge, as the controls won't stretch across the window as expected. Each line will only take up as much room as it needs, no more, no less. Which does not give you a pretty UI. To make that DataTemplate stretch across the screen, you've got to add some information to the ListView (or it's style). First, you need to provide the HorizontalContentAlignment value to read "Stretch" Then, you need to set the horizontalAlignment of the ItemContainerStyle to "Stretch" as well. But it's still not quite right. If your data extends beyond the size of your window, your controls won't wrap as expected (say you're binding to a TextBlock and you expect all the text to be displayed in the control's viewable space). To fix this, you need to tell the HorizontalScrollbar to be Disabled (which in the Listview is accessed via t he ScrollViewer.HorizontalScrollBarVisibility property). The final prettification that you'll need on the control is if you want alternating background colors. This takes two steps. The First is to add the AlternationCount to the ListView. The second is back to the ItemContainerStyle, and you will need to add a Trigger on the ItemsControl.AlternationIndex. When the Value is 0, give it one color, when it is 1, give it another. Note that you can have as many alternation colors as you'd like.